The Austrian statesman Engelbert Dollfuss served as chancellor of Austria from 1932 to 1934. On May 20, 1932, Dollfuss became chancellor of Austria, although his government possessed only a one-vote majority in the Nationalrat (lower house of Parliament) and a minority in the Bundesrat (upper house). 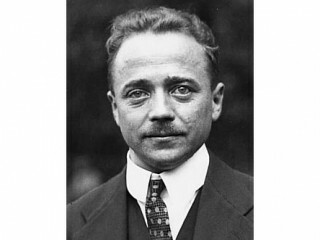 To strengthen Austria's financial position, Dollfuss obtained a loan of Â£9 million sterling from the League of Nations in return for an agreement not to enter a customs union with Germany for 20 years, a stipulation which angered pan-German, Nationalist, and Socialist elements in Austria. Subject to bitter attacks from all sides, Dollfuss suspended Parliament when its three presidents resigned on March 4, 1933, and thereafter ruled by decree. In May he founded the Vaterlandische Front to mobilize support for his rule, and it was with this organization that the notorious Heimwehr merged in 1934. The latter was a defense force formed after World War I; it later espoused Italian Fascist principles, became a political party in 1930, and perpetrated acts of terror and violence against its opponents. View the full website biography of Engelbert Dollfuss.